Vejer de la Frontera is ideal for both outdoor & cultural activities due to its proximity to pristine Atlantic beaches and beautiful natural parks as well as its rich culinary tradition and history. Enjoy the golden sands and dunes of El Palmar (12km.) all year long. Ideal for walks in the winter, and swimming and sunbathing in the spring/summer months. Historic Cape Trafalgar and its coves and beaches (15km.) are great for swimming, and are a kite surfer’s heaven when the wind picks up. The beaches of Barbate (11km.) and the 18km-long beach from Barbate to Atlanterra are a favorite for locals to escape to and spend an afternoon, as even in the peak of summer there is plenty of space to relax. Learn to kitesurf in Conil, Los Caños or Tarifa. Courses, schools, and equipment are available for hire locally. Riding stables just 5km. from Vejer offer you trots through empty beaches from autumn to spring, or stunning rides through pine forest and open country. Stables are managed by both local and foreign owners. Go sea or lake kayaking from April to November. Great scenery, good weather, and warm water. Take a mountain bike for rides either along the coast or on quiet trails through the interior. From Vejer to the beach on hilly tracks takes an hours ride there. Bike hire is available in Vejer. Live it up with paragliding! Vejer has its own launch point and paragliding school on the crest of the hill looking towards the coast. Courses and dual flights are available depending on wind conditions. Walk from Vejer to the beach through open countryside & pine forests to Trafalgar Bay. Maps and guide books are available from hotels and the Tourist Office. Enjoy diverse birdwatching– this area is on one of Europe's busiest migration routes. Enjoy local bird watching, from coastal to wetlands & raptors in the nearby highlands. Local guides can offer day tours and birding tours for novices and experienced 'birders'. Walk to the Santa Lucia roman aqueduct, explore the aqueduct with its rushing spring water before enjoying a meal in one of the garden restaurants in the valley. Take a kayak or be guided from a small vessel through the dunes & waterways of the Cádiz Marine Park seeing a mass of birdlife. Take a day Whale Watching in the Straits from nearby Tarifa, see Cachalote, Finn Whales & Dolphins. Don’t miss the Orcas feasting in August / September. Europe's largest oak forest the 175,000ha. Alcornocales Nature Park is a 30min. drive from Vejer giving access to a series of fresh water lakes & a walk to a 1,000m. peak. A day excursion could take you to Coto Donana, Europe’s most important Biosphere reserve. Learn a language! Vejer has one of the Costa de la Luz's finest language schools, Colegio La Janda, with fun experienced staff in a wonderful historic building. Visit the NMAC contemporary outdoor sculpture park just 5km. from Vejer. With stunning works by James Turrell, Huang Yang Ping, Fernando Sánchez Castillo, Michael Lin and more than 20 other artists. Relax with a charming nocturnal walk through Vejer's romantic narrow alleys & courtyards. Enjoy the outstanding fish market in Cádiz (45km.) & explore the towns charming backstreets, monuments, parks & lively local shopping. In Jerez (50km.) you can’t miss the famous sherry bodegas for a history tour & a tasting! Nearby Medina Sidonia & Tarifa are historic small towns with a rich legacy of monuments, history & views. A popular day excursion is a visit to Tangiers, North Africa’s northernmost town via Tarifa (45km.). Leave Vejer by 8.00 in the morning and be back by 10.oo at night. Enjoy everything from really good local cooking to international fare both inland and on the beach. Vejer classics and not to be missed eating experiences in and around Vejer include; El Jardín del Califa, Casa Varo, Viña y Mar, Califa Tapas, Corredera 55, Garimba, La Castilleria (Santa Lucia), Venta el Toro (Santa Lucia), Restaurante Francisco (El Palmar) & Restaurante Patria (Patria). Further afield the following restaurants offer excellent options; La Duquesa (Medina Sidonia), El Campero (Barbate), la Taberna del Campero (Zahara), Restaurante Antonio (Zahara), El Faro (Cádiz), the Mercado de Cádiz (Cádiz), El Faro de Pto. Santa Maria (Pto. Santa Maria), A Poniente (Michelin**, Pto. Santa Maria) amongst others. Visit three wine ‘bodegas’ locally and see the production process and join in the ‘vendimia’ (grape picking) if you are here at the end of summer. Cooking classes, sherry tasting evenings, tapas tours, events, and market visits will liven your trip! 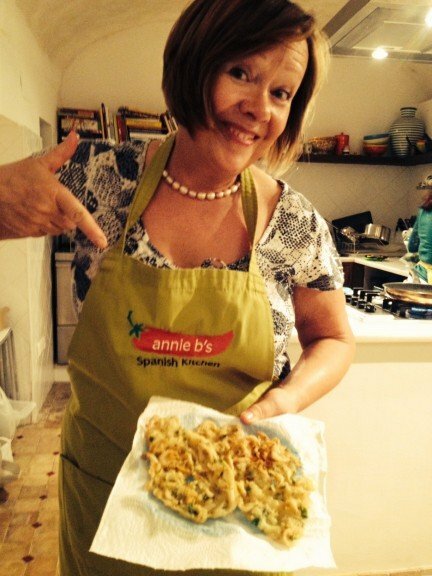 Contact Annie Manson at Annie B’s Cooking School. An unconventional golfer’s destination, Vejer is perfect for those who enjoy uncrowded golfing with scenic views. The outstanding natural wilderness of the Montenmedio Golf course is unique in southern Europe and is just a 10 minute drive from Vejer. The Montenmedio golf course (6.260 meters, 18 holes, and par 72) is different from all other Spanish courses. Not a single building interrupts its fairways and greens. It is surrounded by forests of wild olive, cork oak and pine trees, and has impressive views of the Atlantic and Vejer. Other courses in the area include Fairplay Benalup, Novo Sancti Petro (3 courses), Montecastillo (Jerez), Villanueva, and El Puerto.